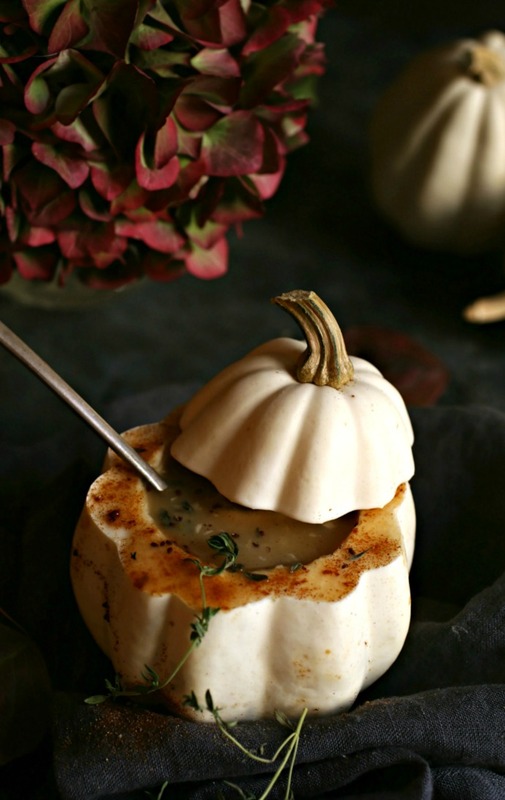 Every year I flip through fancy housewares catalogs and see gorgeous soup bowls shaped like pumpkins and squash, just begging to be added to an elegant holiday table. And I want them. And I imagine making pumpkin or squash soup to serve in them. But I never buy them because they're kinda pricey for something I'll just use at Thanksgiving. 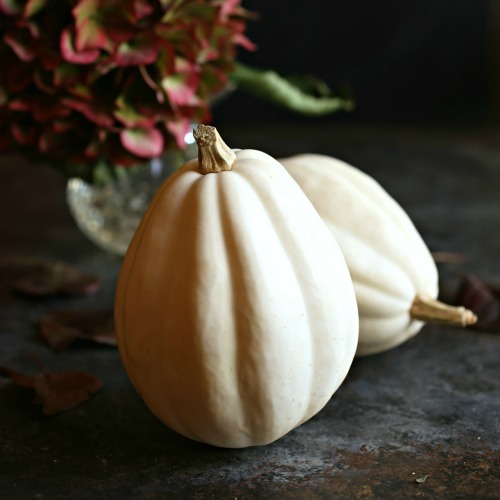 Last week I was strolling through one of the large farmer's markets in the city, on the lookout for decorative gourds for my holiday table and squash to use in the soup. I saw a display of acorn squash and thought those would add a great flavor to the soup, along with potatoes and fresh thyme. 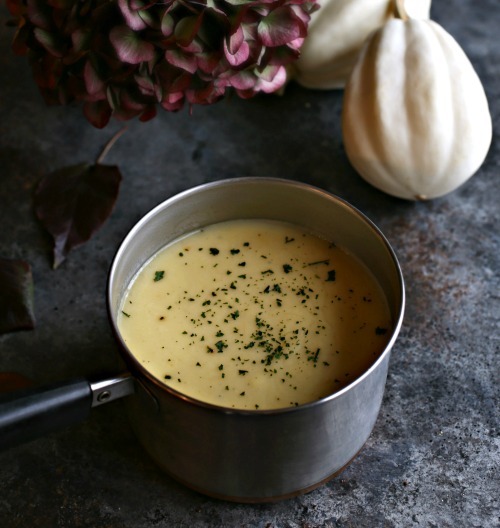 I do always add potatoes to my squash soups because they add a wonderful creaminess and familiar delicious flavor. 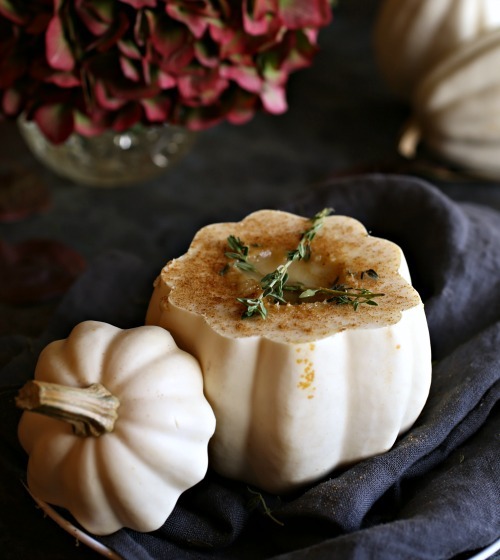 Nestled in among the traditional dark colored acorn squash were the white variety. They were so pretty and they reminded me of the ceramic bowls in the catalog. Well, if I'm using the flesh in the soup anyway, why not just use the actual squash as the bowl? I did a test run and was so happy with both the way the soup tasted and the squash bowls looked that I can't wait to serve them to guests. For the potatoes, I always choose the traditional Idaho baking potatoes for soup. They help balance out the sweetness of the squash and are a great base for any flavor. In this case, I used cumin to add some smokiness. After cooking, I puree the vegetables and my soup tastes creamy without having to add cream. This is definitely comfort food, with or without the fancy bowls. Enjoy! Melt the butter in a large soup pot and whisk in the flour. On medium low heat, slowly whisk in the chicken stock until all the lumps are gone. If you're using the squash as a bowl, Slice the top quarter of the top off and level out the bottom, being careful not to cut a hole. Scoop out the seeds and, using a sharp serrated knife, cut out most of the flesh, leaving enough along the sides to make the squash stable. Add the flesh of the squash along with the potatoes and onion to the pot. Season with salt, pepper, cumin and thyme. Bring to a boil, cover, reduce the heat to low, cover and simmer for 30 minutes. Puree the cooked soup using a stick (immersion) blender or traditional blender. 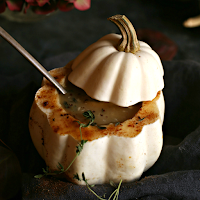 Stir in the milk and serve in the hollowed out squash bowls. Brilliant idea. I never think about the combination of potato and acorn yet. Here the soup of its combination is so excellent, hope it will be so tasty. thesis writing service reviews help me to get cooking tips.